Personalised this gorgeous shiny sterling silver, rose gold or gold star pendant necklace with her initial and birthstone charms to create a unique keepsake gift for her. 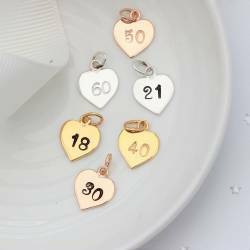 You can create a bespoke personalised birthstone necklace by adding further charms such as a number charm to celebrate a milestone birthday, maybe 16th, 18th, 21st, 30th or a special anniversary. Or perhaps their Zodiac star sign on a silver charm for her birthday, Valentines or Christmas. The price is for a star necklace with one initial charm and a birthstone on a chain. You can choose to have a letter charm or an initial stamped on a heart, disc or star. 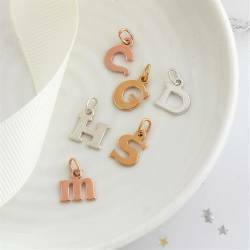 The letters on the charms can be patinised (black finish) so they stand out, or we can leave them silver or gold (clean finish) for a more subtle look. We can only stamp one initial onto the front of each charm. The charms and birthstones can be removed from the chain, so the star can be worn on its own or with the clusters and initials. The gemstones are genuine faceted gemstones and so the more expensive ones such as sapphire are smaller than the others. Given they are natural they may vary slightly from the images shown. There are 2 options for October and 3 for June. The birthstone form a cluster with a tiny silver heart. The gold and rose gold versions are just on a ring. Once we’ve created the perfect personalised necklace for you, we’ll carefully package it in one of our beautiful black gift boxes with a birthstone gift card for the birthday month you select. We’ll then finish it with a flourish of ivory ribbon ready for you to give to the lucky lady. The open star measures 2.4cm and hangs approx 2.5cm from the chain. The disc charm is approximately 0.9cm with the loop it hangs approx 1.5cm from the chain. The box chain is available in 4 lengths approx 14"/35cm (childs or choker length) 16"/40cm,18"/45cm and 20"/50cm.